We repair Lawnmowers, weed whackers, chain saws, leaf blowers, generators, and MUCH more! Need us to pick up and drop off? We can do that! Top Brands including Husqvarna, Gravely, John Deere, Tanaka, and more! Come visit our showroom for a test drive. Affordable, competitive prices. Special orders. We deliver! Our used equipment comes with a warranty and guarantee that you’ll be satisified with your purchase. Save money by buying used. Let us know what you’re looking for! 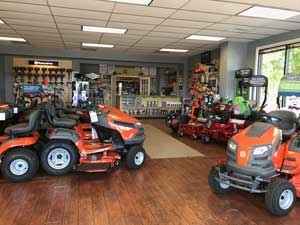 Family owned and operated, we repair and sell small engine equipment such as: lawn mowers (push, riding, and zero turn), leaf blowers, chain saws, generators, snow blowers, and more. They did a tune up on my generator and blower. Both work better than new. They always try and help whatever way they can! 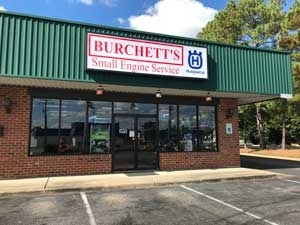 Not only are the people at Burchett’s polite, they make sure all your questions are answered, they stand behind their products, and they make sure you have what you need and deliver on it. I recently bought a new lawn tractor that I had some issues with and they made it right with no qualms. Right on! This is one of the few places I trust to fix my small engines. Awesome Company. I was there today for their new Grand Opening. 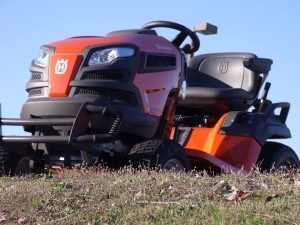 I was so impressed that I bought a Brand New Husqvarna MZ 52 – 52″ Zero Turn Mower. My old Zero-Turn was 9 years old and showing its age. They delivered it lightning fast and the delivery driver took time to show me all the ins and outs of the mower. Needless to say, Burchett’s has sealed my business for the rest of my days!